Last weekend, Tony and I took a road trip up to beautiful Holland, Michigan for a European car show called Euro Hangar. We took the day off work on Friday, loaded up Tony’s R32, and headed out for an 8 hour drive. While we both certainly love our R32s, they are certainly not meant for long road trips. I’ve never before wished I had a wagon in show ready condition! Tony drove the whole way and I entertained myself by seeing how long I could make one bag of Gardettos last (not long). We made it through Wisconsin with no problems, but Illinois and Indiana provided us with almost non-stop traffic. After a 9 hour drive, we made it to our AirBnB with enough time to wash the R with a gorgeous sunset in the background. Thanks for the beautiful welcome, Michigan! The next morning, after I decided which R32 themed shirt to wear, we excitedly jumped in the R and drove the mile and a half to the show. We arrived as the show was officially starting, and the line up of beautiful European cars was astounding! Cars of all shapes, sizes, ages, and colors were ready to show off their proudest feature. Someone even drove a Volkswagen truck all the way up from Mexico! I might be a little biased, but one car stood out to me the most. After the car admiration show ended, Tony and I went to downtown Holland to check out what was going on. Naturally, we managed to quickly find a brewery right in the heart of downtown. We spent a few hours there, trying ales, IPAs, and stouts, all while chatting up locals and tourists alike. Someone brought up the windmill, and we knew we couldn’t leave without at least seeing them! Tony and I then went to Windmill Island (after soaking up the alcohol with an equally delicious amount of carbs). Although they were officially closed, we pretended we were with the wedding that was going on and “casually” snuck right through. Seeing the giant windmill looming above me was extremely emotional, knowing that this was the last trip my grandpa took before he passed away. Knowing he was looking down on me, happy I had made the trip, I told him how much I miss him every day. 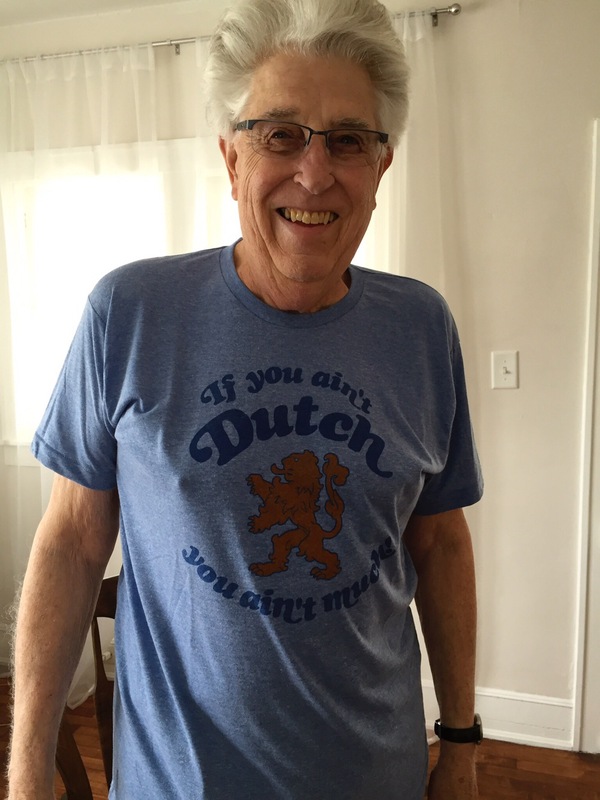 The entire trip made me think of him in his beloved “if you ain’t Dutch, you ain’t much!” t-shirt. The day started off on a good note. We stopped by Lake Michigan and the sand dunes, which were both awesome to see! We snapped a few quick pictures and headed on our way, eager to get home. As anyone who has driven in Illinois knows, their roads aren’t the best, especially when combined with 85mph traffic. After we hit one too many bumps, we heard the noise. That dreaded hissing noise. Tony pulled over and immediately confirmed our worst suspicion. We had a flat tire in a car that, from the factory, didn’t come with a spare. We quickly weighed our options, which were basically two; leave the car and become one with the interstate, or figure out a way to get a new tire. We decided on the latter. Tony called a Pepboys that was a couple miles away and found out they had his tire size in stock. The only thing was…we didn’t have a way to get there. But wait! Technology!! Thankfully, we had pulled over right under an Oasis. I ordered a Lyft to our location and we waited. Although our driver was a little weirded out after seeing we were carrying a wheel, I think he felt bad for us, because he was happy to drive us anyway. We made it to Pepboys, bought the tire and then waited, and waited…and waited for the tire to be installed. Two hours (and a very grumpy Lauren) later, we had to repeat the entire process in reverse. I called a Lyft to Pepboys, and he called me immediately after, questioning why the hell I needed a ride from Pepboys to an Oasis. I explained our predicament and once again, Tony, myself and a wheel managed to get a ride in a stranger’s car. (Sorry mom!) Since Tony is a technician, he never travels without all the tools necessary to work on his car. He had everything he needed to quickly put his wheel back on, adorned with a fresh new tire. What was supposed to be an 8 hour drive turned into a 13 hour ordeal, but what is life without a little excitement?! As soon as we got home, we both had the best night of sleep we have had in a long time! And I think it was well deserved. And even after all that, all I can think is…Alright, where’s the next road trip?